What could be more fun than an afternoon at the carnival with family and friends, and where else, but at a Carnival Americana midway? Our carnival features a wide selection of the most thrilling and exciting rides available. 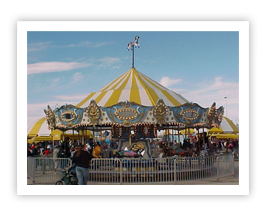 At Carnival Americana, we design every carnival midway to provide a well-rounded selection of fun and exciting rides for all age groups. The more experienced riders will appreciate our wide variety of thrill rides, while our younger guests and parents will enjoy our expansive kiddieland. All guests will appreciate our fun and fair midway games, which give every player a fair shot at winning quality prizes. Don't miss our first-class food stands featuring the best and most delicious carnival food items available.